You can also reset two-factor authentication and generate backup codes and more. 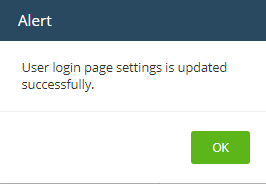 Click 'OK' in the alert screen. 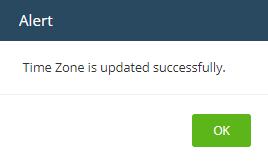 Select your preferred zone from the drop-down menu. 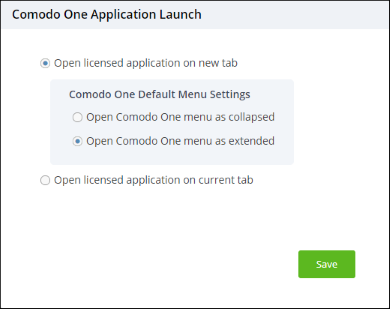 Scroll to the 'Comodo One Application Launch' tile. The tile lets you choose whether you want modules opened from the 'Applications' menu to open in a new tab, or the same tab. Open licensed application in new tab - The application you choose from the 'Application' menu will open in a new browser tab. 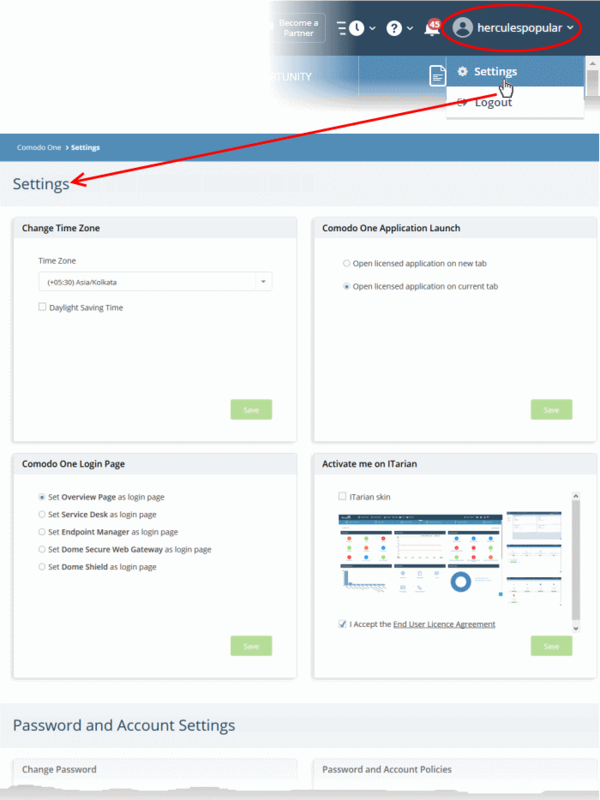 You can also choose whether the Comodo One menu should be visible above the application interface. Open Comodo One menu as collapsed - The Comodo One menu bar is not shown on the new browser tab. You can open the menu bar by clicking the down arrow at center top. Open Comodo One menu as extended - The Comodo One menu bar is shown on the new browser tab. Open licensed application on current tab - Applications will load in the same tab. The Comodo One menu bar is displayed by default. 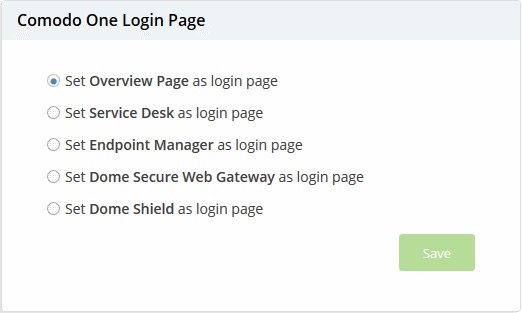 Scroll to the 'Comodo One Login Page' tile. The tile shows all licensed applications added to your account. Select the application that you want to see immediately after you login to Comodo One. The chosen application will open automatically the next time you login to your account. 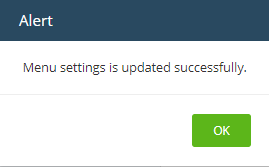 Please note that your role permissions need to allow you to access the configured application. Scroll to the 'Two Factor Authentication' tile. The tile lets you reset two-factor authentication for the admin account and regenerate backup codes. You will be prompted to repeat the two-factor authentication process at next login. This is applies to account admins only. Other users need not reconfigure unless two factor is reset in 'Staff Management' > 'Staff'. 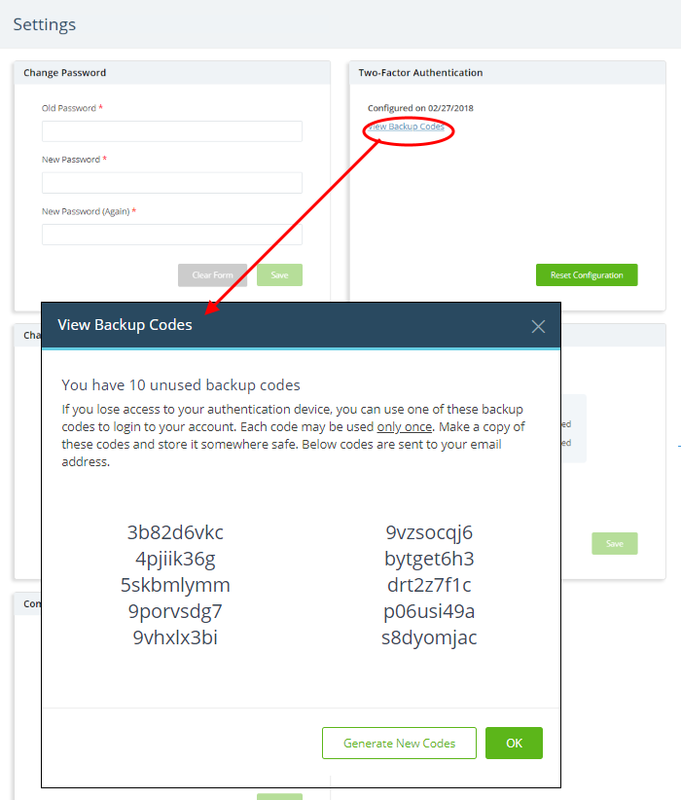 Keep a copy of the backup codes so you can login to Comodo One when you don't have access to your authentication device. 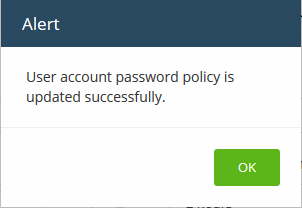 After you generate a new set of codes, you cannot use the old codes. Select whether you want to use the Comodo One console or the ITarian branded console. You can access all your apps and account details from both skins. Note - You cannot switch ITarian skin to Comodo One skin. 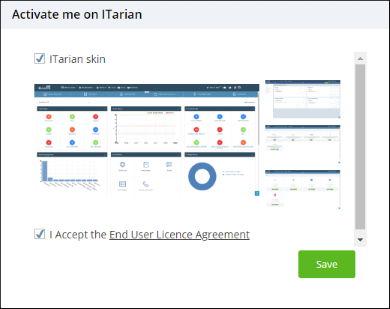 Contact support@itarian.com if you wish to switch to the Comodo One skin. Scroll to the 'Activate me on ITarian' tile. Your interface will change immediately to ITarian skin. 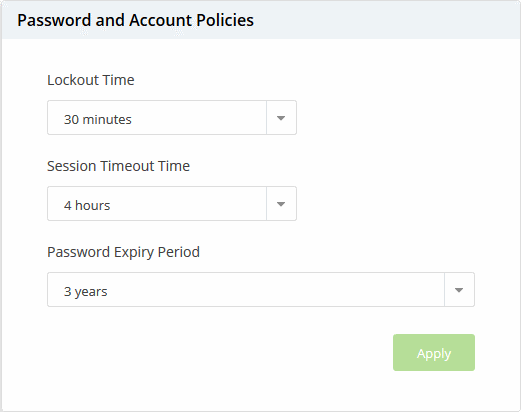 Note – you cannot switch back to Comodo One skin from the settings screen. Contact support@itarian.com	if you wish to switch back to Comodo One skin.